Under AS 4000, you can only claim an extension of time for carrying out WUC (including reaching practical completion) if you are delayed by a ‘qualifying cause of delay’. iii) stated in Item 23." Importantly, Item 23 in the Annexure Part A is intended to identify causes of delay for which EOTs will not be granted. You will need to check Item 23 to see whether any types of delay are excluded from the definition of ‘qualifying cause of delay’. Learn more about the definition of a qualifying cause of delay under AS 4000 here. working days (eg where your program is based on a 6 or 7 day working week). There is no harm in including more than one type of day (eg working days and calendar days) in your notices. The key is to ensure that you are consistent. Working days are often used as the starting point, because a calculation in working days can then be used to determine a specific date to which the date for practical completion should be extended. Some superintendents and principals prefer to think in calendar days (or business days), which is why notices expressing a delay in different types of ‘day’ can be useful. If you become aware of anything that ‘will probably cause delay to WUC’, clause 34.2 requires you to ‘promptly’ submit a notice of the delay to both the principal and the superintendent. This obligation applies regardless of whether the delay is a ‘qualifying cause of delay’. your estimate of the delay. If there is insufficient information to be confident about the likely duration of the delay, as a matter of prudence you should say so (and explain why) in your notice. If you are unable to provide a precise estimate, a range of estimates should be acceptable (eg ‘between 4 and 5 weeks’). Clause 7 of the AS 4000 requires a notice to be sent to the ‘relevant address in the contract or last communicated in writing’. You can read about serving notices by email here. Get free access to a template notice of delay form here. 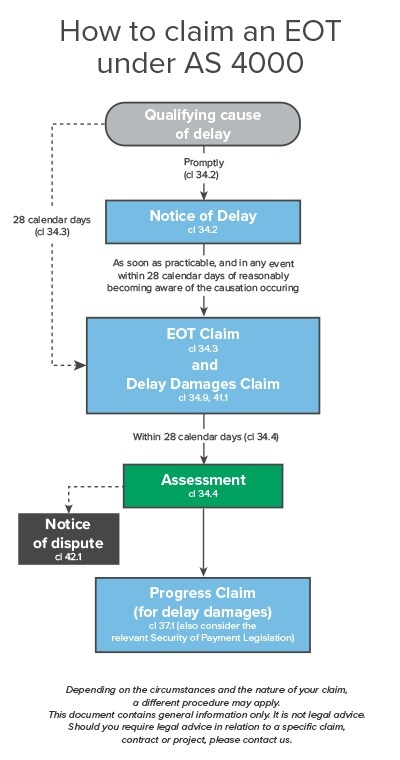 Clause 34.3 of AS 4000 requires you to submit your written claim for an EOT within 28 calendar days of when you should reasonably have become aware of the causation occurring. It is important to appreciate that a notice of delay (under clause 34.2) and a claim for an EOT (under clause 34.3) are two different things. The purpose of a notice of delay is to bring a probable delay to the attention of the superintendent and the principal. 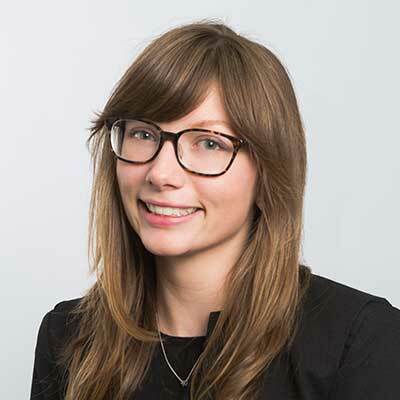 The purpose of an EOT claim is to formally claim an extension of time, if the delay eventuates (and assuming it involves a ‘qualifying cause of delay’). the delay (including its extent). Typically, the best way to demonstrate the impact of a delay is through the inclusion of an impacted program that shows how the critical path is affected by the qualifying cause of delay. When assessing your EOT claim, the superintendent is required to take into account what prevention and mitigation of the delay have not been effected by the contractor. Because of this, it is sometimes useful to explain in your delay claim what you have done to prevent and/or mitigate the delay. Get free access to a template delay claim form here. Clause 34.9 entitles you to claim delay damages for each day that is a ‘compensable cause’ and that is the subject of an EOT. b) those listed in Item 26." Item 26 in the Annexure Part A is intended to identify additional causes of delay for which delay damages may be claimed. If ‘Nil’ appears in Item 26, this does not mean that there will never be delay damages. It just means that there are no additional causes of delay that will be treated as compensable causes. A claim for delay damages must be in writing and set out the general basis of the claim and the quantum of the claim. Typically, this means that you will need to identify the cause of the delay, explain why it is a compensable cause and you are entitled to claim delay costs (if this is not obvious), and then identify the quantum of the claim and include relevant supporting documentation. Contractors will often include their claim for delay damages in their claim for an EOT. There is no harm in taking this approach. If a further delay results from a qualifying cause of delay for which you have claimed an EOT, clause 34.3 requires you to ‘promptly’ submit an updated written claim to the superintendent evidencing the facts of the additional delay. If you disagree with the superintendent’s assessment, you can issue a notice of dispute under clause 42.1. 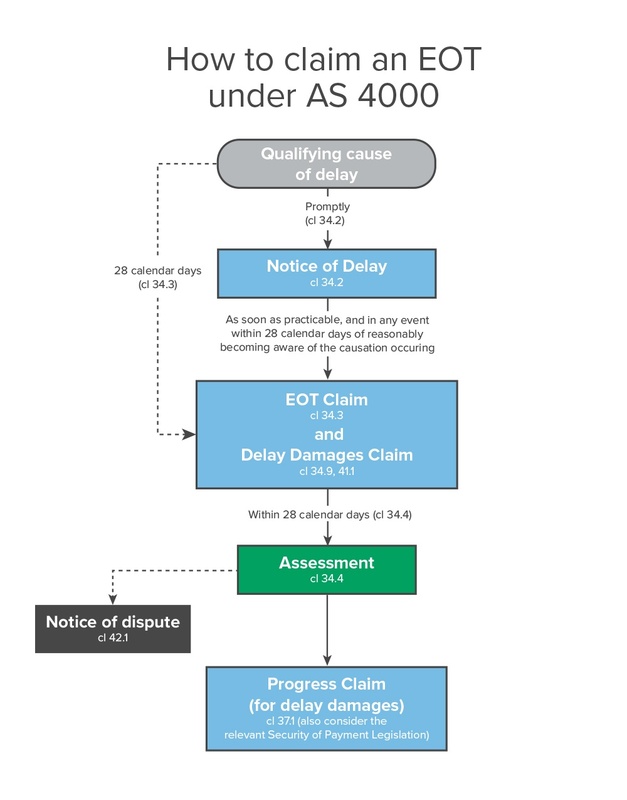 Download a PDF copy of our flowchart on how to claim an EOT under AS 4000, as well as our free template forms for a notice of delay and a delay claim in our AS 4000 Contract User Guide here.